The BodyTalk: What makes us Different? Don't you think they are looking alikely CUTE? What makes us Different? by Michael D. Lemonick and Andrea Dorfman in TIME says, "Chimpamzees share roughly 98% to 99% identical to humans at the genetic level. When it comes to DNA, a human is closer to a chimp than a mouse to a rat"(46-47). The Puzzling Origins of AIDS by Jim Moore in American Scientist, Vol 92 says, "Most recent work has shown that the closest relative of the primary human immunodeficiency virus (HIV-1) is another simian immunodeficiency virus, one carried by chimpanzees (SIVcpz)." SIVcpz cross over into humans and become pathogenic. Surprisingly, SIV is harmless to its hosts (chimpanzees) when HIV causes AIDS in human. I read Jim Moore's article about AIDS origins a while ago and just finished reading about "what make us different?". My "un-expert non-scientist" mind happen to assume that maybe we can find the answers for AIDS in those differences of 1- 2% genes and find the cure for AIDS. Do you guys think it might be possible? my blog has a nice name,my blog name is "eyereach".i agree with u,i like the name also. the same viewpoint on something.Haha,i think u must can read my words though my English is so bad.your blog have more connotation than its' outside. and i forgot intro myself just,my name is Ju Pengfei(琚鹏飞).I am 21 years old.I like all simple things,just like my blog's theme. They do actually look alike! haha.. but i prefer the little baby.. much cuter! Does that explain my affinity for climbing trees? Interesting. 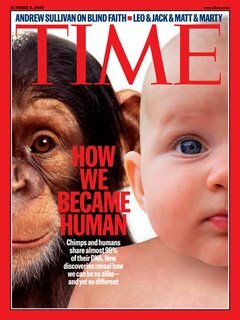 I did not realize that there was so much held in common between chimps and humans. Hopefuly you are spot on with your observation and researchers will be able to get it worked out.